Football training for 4th, 5th and 6th class girls will take place on Tuesday evenings and training for 5th and 6th class boys will take place on Friday evenings,both in our school pitch between 3.10p.m. and 4.00 p.m. This will continue until the Halloween break, weather permitting. Girl’s Football: Well done to the girls football team who have played two matches so far against Clonmoney and Ballyea and won both matches. Boy’s Football: The boys have also played two matches- winning one against Gaelscoil Mhichíl Chiosóg and losing narrowly to Ennis National in their first game. Football Training: Football training for both boys and girls from 4th – 6th class ,will take place on Friday evenings in our school pitch between 3.10p.m. and 4.00 p.m. starting this Friday. This will continue until the Halloween break. Hurling/Camogie training will then start up after Halloween. 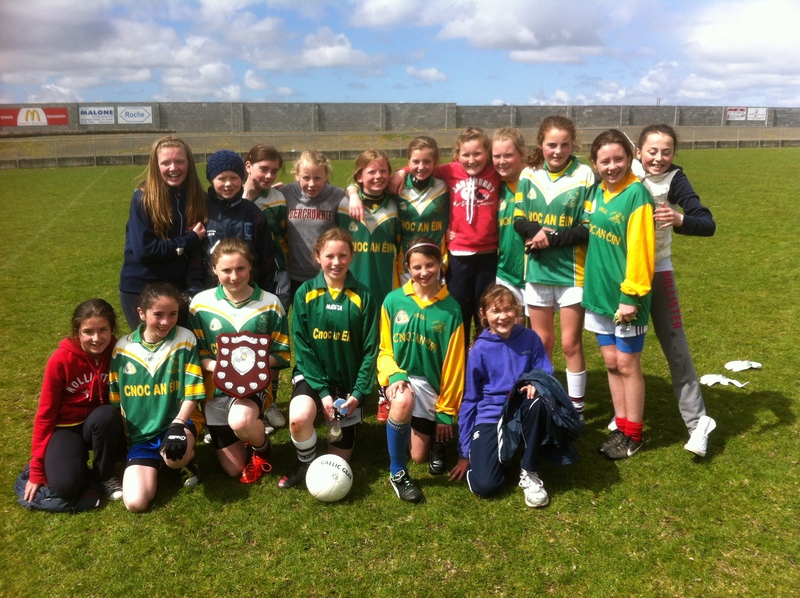 Girl’s football: West Clare Division Final: On the 31st of May the girl’s football team from 4th, 5th and 6th travelled to Gurteen to play the Gaelscoil in the West Clare Division Final. The game was very close and the Gaelscoil got a goal in the first seconds but failed to score for the rest of the first half, while Knockanean scored 1:4. In the second half, the game got even closer with a number of goals scored but in the end Knockanean came out on top. Thanks to Mr. Curran. And another trophy for Knockanean!!! On the 30/04/13 the girls in 5th and 6th class went to Clarecastle to play the final of the mini 7s.We played Barefield, Cratloe and Lissycasey. We won all our matches. In the final we played Miltown Malbay.It was 6 minutes a half and a VERY close game but Sadhbh Kelleher managed to score the winning point in the last ten seconds of the game which means we are the winners of the mini 7s 2013.!!!!! So well done to all the girls! On the 18th of April the girls from 5th and 6th class went to Gurteen to play Cloughleigh and Clarecastle. We beat Clarecastle and Cloughleigh which means we are through to the final on the 30th of April. Well done to all the girls who participated and good luck in the final! By Mia Norton and Saoirse O’ Donoghue. Boys 7 a side football finals: The boys 7 aside football team went to Gaelscoil Michael Chiosog to play the seven aside football finals. We played our first game against the Gaelscoil and beat them by a good few points. We then played Lahinch but lost by just a point. Annagh / Coore went on to win the tournament.